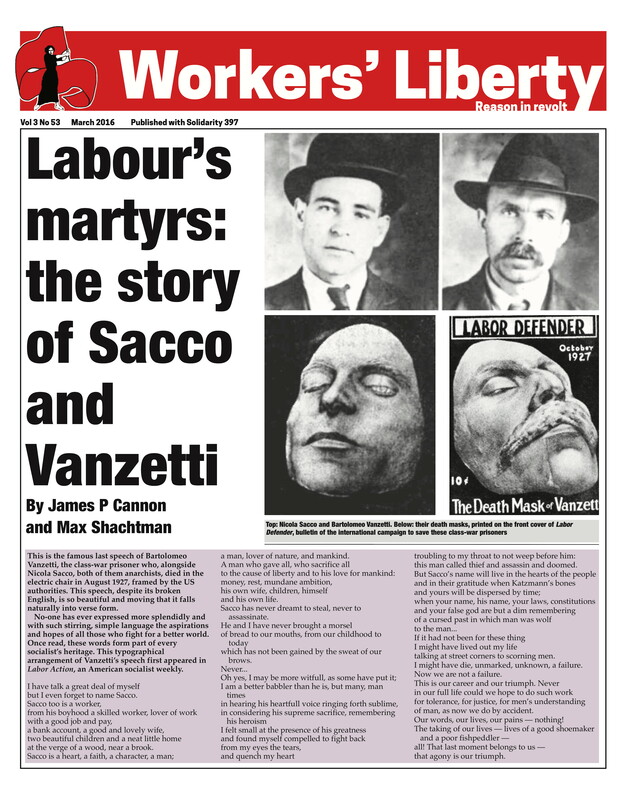 Workers' Liberty 3/53, published as a pull-out in Solidarity 397. The story of the Sacco and Vanzetti case, told by James P Cannon and Max Shachtman, who were leading activists in the defence campaign. Who can save Sacco and Vanzetti? The Sacco-Vanzetti case is at a turning point. Legally speaking, it now rests on another appeal to the Massachusetts State Supreme Court from the latest decision of Judge Thayer refusing a new trial. But speaking from a more fundamental standpoint, that is, from the standpoint of the class struggle, the issue really hangs on developments taking place within the Sacco-Vanzetti movement which embraces many workers of various views. The working-class victims of bourgeois repression and deliberate murder are legion. The murder of Nicola Sacco and Bartolomeo Vanzetti, who were burned alive in the electric chair in Massachusetts, on August 23, 1927, was a cold-blooded crime committed by the American capitalist class in the full sharp glare of world wide attention and protest. Mass demonstrations were organised in every city in the world where Communist and Socialist movements existed. Protests and demands for clemency were made by many well known writers and politicians. This is the famous last speech of Bartolomeo Vanzetti, the class-war prisoner who, alongside Nicola Sacco, both of them anarchists, died in the electric chair in August 1927, framed by the US authorities. This speech, despite its broken English, is so beautiful and moving that it falls naturally into verse form. No-one has ever expressed more splendidly and with such stirring, simple language the aspirations and hopes of all those who fight for a better world. Once read, these words form part of every socialist’s heritage. to 15 years by Judge Thayer in Plymouth. THE United States government is on its trial for murder. The indictment is that in order to conceal the secret murder by its police of an Italian worker, Andrea Salsedo, it is now judicially murdering two other Italian workers, Nicola Sacco and Hartolomeo Vanzetti.